Tijuana Flats menu prices here. Tijuana Flats is an American, fast-casual chain of restaurants serving made-to-order Tex-Mex cuisine. Guests order their meal at the front counter and meals are delivered to the table by Tijuana Flats team members. Along with the fresh tasting food, Tijuana Flats is also well known for their unique hot sauce bar and eclectic mural art. All menu items are prepared on site using fresh ingredients. There are no microwave ovens or freezers at Tijuana Flats locations. Tijuana Flats also offers vegetarian and gluten-free options. Fans can connect and follow Tijuana Flats on various social media platforms. Below is the latest Tijuana Flats menu with prices. Getting your Tijuana Flats fix is easy with Online Ordering. Guests can order any or their favorites online and their order will be ready when specified. Ordering is simple. Guests go online to the Tijuana Flats website, pick the items they want, specify a pick-up and check out. Regular guests and fans of Tijuana Flats can join the Flatheads Club. Flatheads, as they are called, enjoy members-only perks like seasonal offerings, an invitation to exclusive events and special promotional offers. Sign-up is quick and free online. Early on, any attempts were made to create a signature hot sauce. All the effort paid off and today guests can order one of 36 signature hot sauces for themselves. Sauces come in a variety of heat strengths and all have a unique name. Orders can be placed through the Get Sauced page on the official website. Guests can also order saucy T-shirts with a Tijuana Flats logo. Guests can spice up their next social gathering or corporate event with a couple of different catering options. Guests can choose the TRIPS option which is a do-it-yourself service. Guests get to build their Tijuana Flats favorites or guests can order the Party Packs which are custom made burritos or tacos. For more info, guests should contact their favorite location by phone or in person. Tijuana Flats believes in supporting the communities in which they operate especially during times of need. The Just in Queso Foundation provides aid and donations to local individuals, organizations, and communities that are facing a recent tragedy. Making good food choices is a snap at Tijuana Flats. Guests can view or download a complete guide that offers nutritional values for all the menu items. Guest should view prior to their next Tijuana Flats visit. Guests with food allergies can also view or download a guide that indicates which allergens are included in the various menu items. The chart is for guidance only. 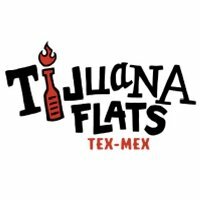 Tijuana Flats is always looking for self-motivated, hard-working individuals that believe in going the extra mile and providing guests with a unique dining experience.Interested candidates should visit the Career page on the official Tijuana Flats website to learn more about the company, its philosophy and browse the list of current openings. Tijuana Flats was the brainchild of Brian Wheeler. In 1995, Brian Wheeler, a recent graduate of The University of Central Florida, decided to open a restaurant in Winter Park, Florida called Tijuana Flats. Brian had no restaurant management experience or funds. A loan from his parents helped get the place started. Today, there are over 100 locations spread across Florida, Georgia, North Carolina, South Carolina, Virginia, and Indiana. Tijuana Flats is privately held and headquartered in Florida. To learn more about Tijuana Flats, visit the official website.